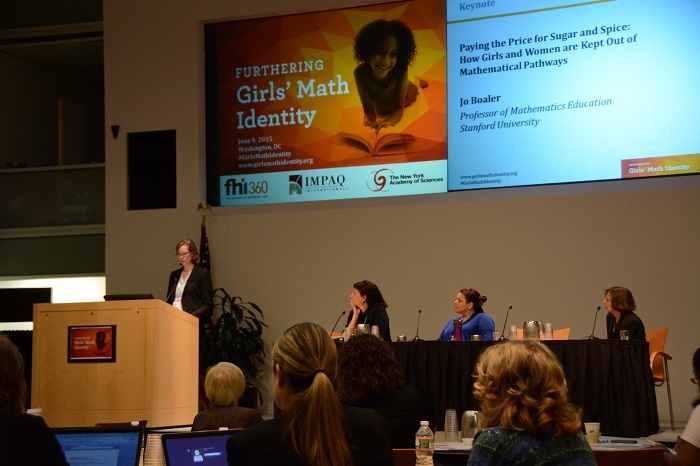 Today, IMPAQ partnered with FHI 360, the New York Academy of Sciences, and the National Science Foundation to lead the invitational Furthering Girls’ Math Identity convening, an event exploring how to develop a strong math identity in girls. At the convening, researchers, practitioners and experts in math identity worked together to identify the primary ‘drivers’ of girls’ math identity and practices they could implement to have a positive impact on girls’ math identity. The group also identified research questions that need to be addressed to advance our understanding of the underlying causes of girls’ math identity and practices that can improve it. The overarching goal of the day was to launch what the Carnegie Foundation for the Advancement of Teaching calls a Networked Improvement Community (NIC). A NIC is an intentionally informed network of educational professionals and practitioners working with researchers to address a practical problem of high importance. The event built on IMPAQ Managing Director and Principal Research Scientist Dr. Cheri Fancsali’s research and evaluation work in education, including a report she co-authored titled Student Academic Mindset Interventions: A Review of the Current Landscape. The report highlights the importance of researchers, practitioners, developers and philanthropists working together to solve problems and address critical needs in the field. The Girls’ Math Identity NIC was designed to bring stakeholders together to do exactly that. Through the work of Dr. Fancsali and the other partners, the Girls’ Math Identity NIC became a reality. In addition to co-leading the event, Dr. Fancsali gave a talk during the event describing what a NIC is and the goals of the Girls’ Math Identity NIC setting the context for the work of the day. The convening took place in Washington, DC and included a keynote address by Dr. Jo Boaler, Professor of Mathematics Education at Stanford University and the co-founder of youcubed, panel discussions, and working groups. Dr. Boaler described the brain research behind math learning and the factors that contribute to girls and women being kept out of mathematical pathways. In her address, she noted two pillars of a positive math identity: belief that you can do math, and belief that you belong. Organizations represented at the event included: Alexandria City Schools, American Association for the Advancement of Science, Association of Science-Technology Centers, Baltimore County Public Schools, George Mason University, Howard County Public School System, Maryland Out of School Time Network, Mathematica Policy Research, the National Council of Teachers of Mathematics, New York University, TERC, the University of Connecticut, the University of Virginia Curry School of Education, US. Department of Agriculture, US. Department of Energy, and Vanderbilt University.